- Registration is FREE. However you are required to purchase OTAFUSE event tickets. - AniSong stands for Anime Song, so the songs must be from Japanese Anime series. 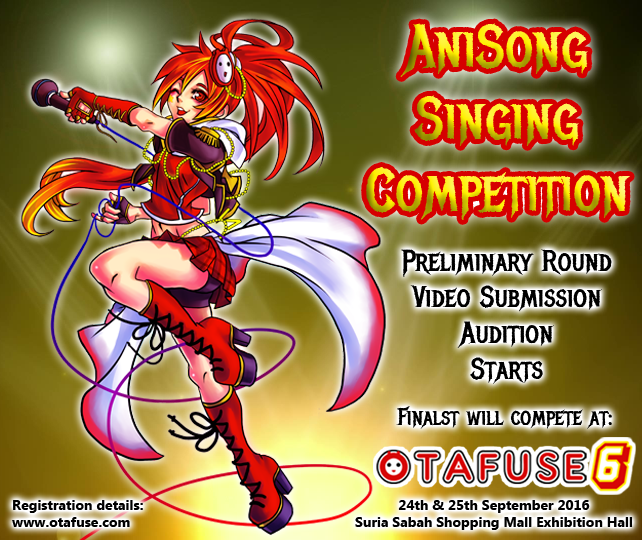 - You can sing their Opening (OP) , Ending (ED), or Anime OVA/Movie/Insert songs. - Vocaloid songs are acceptable. No J-Pop and Video game songs. - The contest is open for Solo , Duet, and Group of maximum 3 person. - If a person joins as a Solo, he/she is not allowed to join in a different team of Duet or Group. - The Preliminary Round will be a Video Submission online audition, which means you are required to record your singing performance and send us by Youtube or Email. - For the Video Submission, it is OK to sing by looking at lyrics. - Songs for the Finals can be same or different than the one used during audition/preliminary round. - Holding lyrics while singing (at the Finals) is not recommended and may result in deduction of points.